PF&A's VCU / VCU Health collaboration project to provide health and wellness programs to Richmond's under-served East End residents is almost complete. We had a chance to inspect the work this week. We are thrilled to be a part of this exciting project! Click on image for complete article. Hampton Roads Association for Commercial Real Estate (HRACRE) Design Award’s mission is to identify, encourage and reward excellence in development design in the Hampton Roads MSA (Metropolitan Statistical Area). 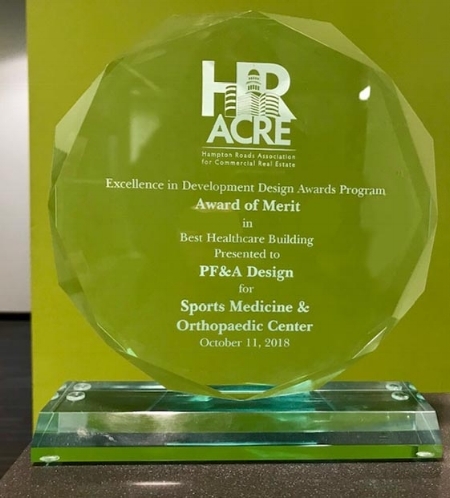 PF&A is honored to have received the Best Healthcare Building Award of Merit for the Sports Medicine & Orthopaedic Center (SMOC) in Chesapeake, Well done and congratulations team! 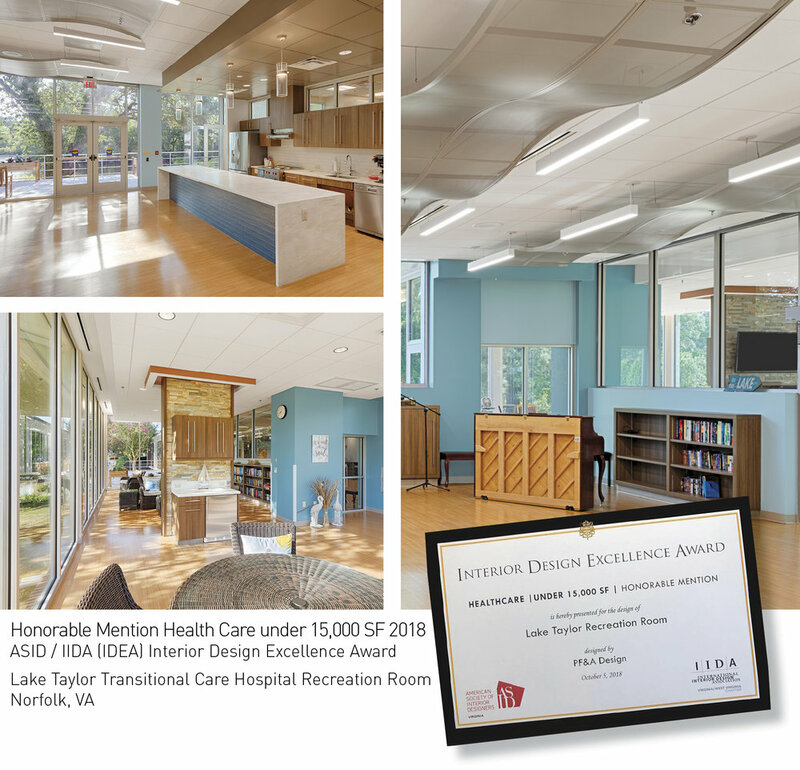 ASID/IDEA Interior Design Excellence Award’s mission is to recognize outstanding interior design projects in our community. PF&A is honored to have received two awards at this year’s ceremony! Well done and congratulations team! 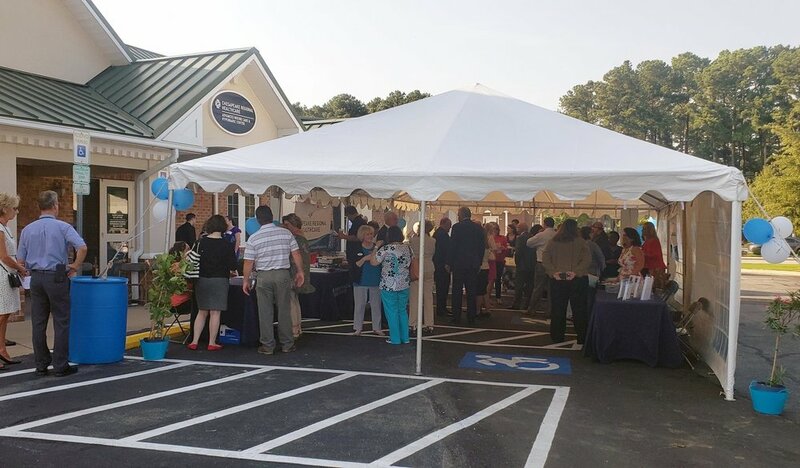 A ribbon cutting ceremony hosted by the Elizabeth City Area Chamber of Commerce took place on August 28th, 2018 for the new Advanced Wound Care and Hyperbaric Center designed by PF&A for Chesapeake Regional Medical Center. The Center uses a comprehensive approach for patients with slow and non-healing wounds. In addition to traditional wound care, patients living in or near Elizabeth City, NC will have access to specialized hyperbaric oxygen therapy (HBOT) at the new center. Wounds need oxygen to heal properly. During the HBOT process patients lie inside a pressurized chamber that delivers 100 percent oxygen with increased atmospheric pressure. This increases the level of oxygen in the tissue, improves healing efficiency of white blood cells and stimulates the entire body’s natural healing responses. Patients undergoing hyperbaric therapy have complete privacy in comfortable, individual chambers equipped with televisions and access to music for patient entertainment. Children's Hospital Finds Flooring Solution! At PF&A we are always in search of superior products and finishes for our healthcare projects. Read more about our process for selecting flooring systems for surgical environments in this article by Dur-a-Flex. Exciting news to be involved in VCU's East End Project! PF&A is so excited to be involved with this project for VCU! 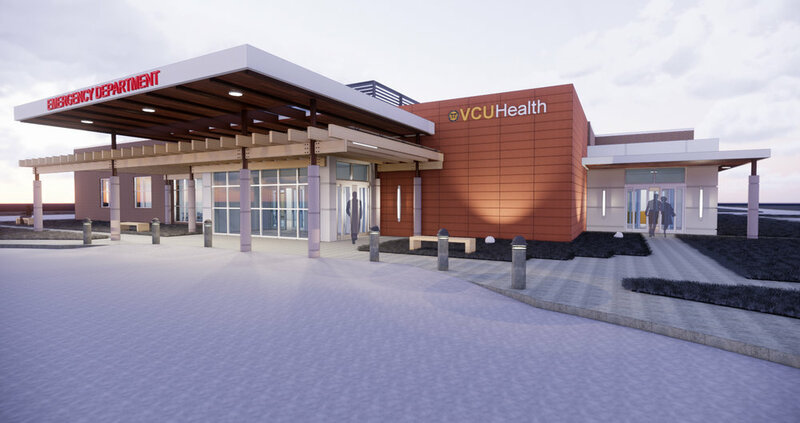 Virginia Commonwealth University and VCU Health System are teaming with community partners to develop a health education and wellness center that will serve residents of Richmond’s East End. The health education and wellness center will be located at the intersection of Nine Mile Road and 25th Street as part of a larger redevelopment initiative that will also feature a grocery store, apartments and a culinary institute operated by J. Sargeant Reynolds Community College. 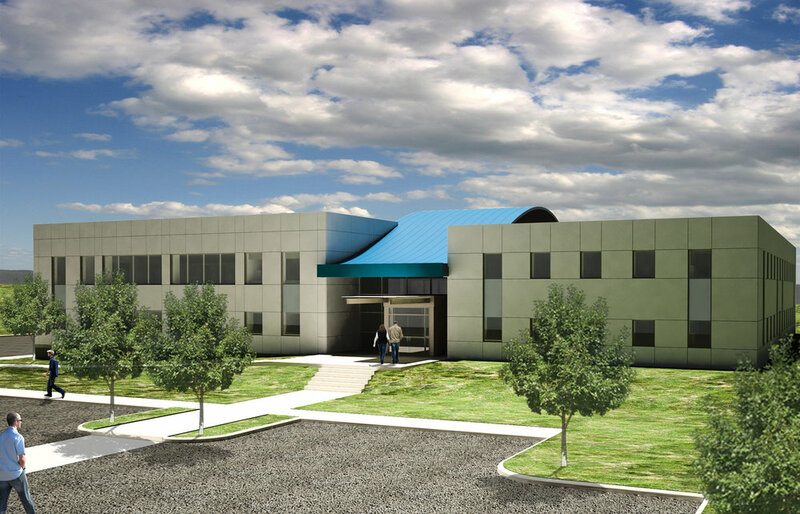 PF&A is currently providing healthcare architectural consulting services for a new 18,000 square foot building to house a dental outpatient clinic for the VA Medical Center in Martinsburg, WV. This project’s original scope included space for both dental and audiology clinics and our initial design included both clinics. While using SEPS to validate the program, it was determined that the original program was inadequate to handle the current dental workload; SEPS results indicated more square footage for dental than was allotted by the preliminary program. Due to these SEPS space requirements, the program was revised to include the dental portion of the project only. The audiology clinic portion of the project will be designed under separate contract. The building is being designed to allow for future vertical expansion. Altro Whiterock Digiclad, custom wall panels create the ideal mix of function and aesthetic for Sports Medicine and Orthopaedic Center in Chesapeake. Since 1948, the St. Albans Community Living Center has provided primary care and offered specialized geriatric programs and restorative rehabilitation for the men and women who have so proudly served our nation. The facility provides inpatient extended care services including skilled nursing, IV antibiotic therapy, palliative care and respite care. Also provided is sub-acute restorative rehabilitation for the elderly. 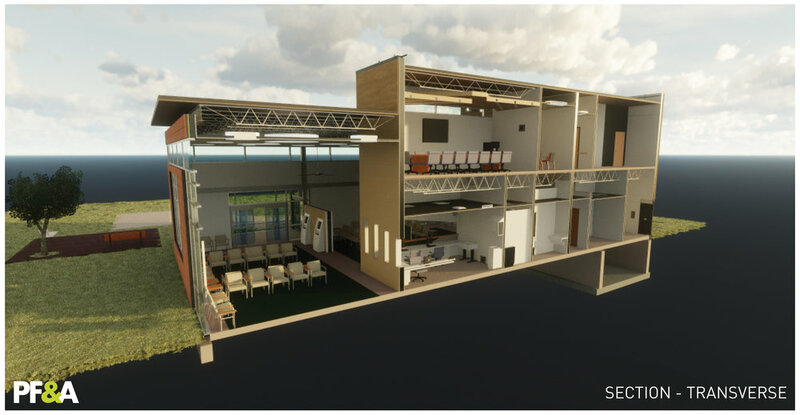 The overarching design concept is to design a space where Veterans feel like they are at home. The goal is to minimize the typical institutional elements of hospitals and introduce more residential and hospitality focused finishes and fixtures. PF&A is providing healthcare architectural consulting services for this project. This level two Green Globes project includes converting and existing garage into a vehicle and maintenance facility in support of the Department of Veterans Affairs campus in Huntington, West Virginia. The first floor includes an approximately 3,200 sf garage, building services, administrative offices, break room, showers, and file storage space. 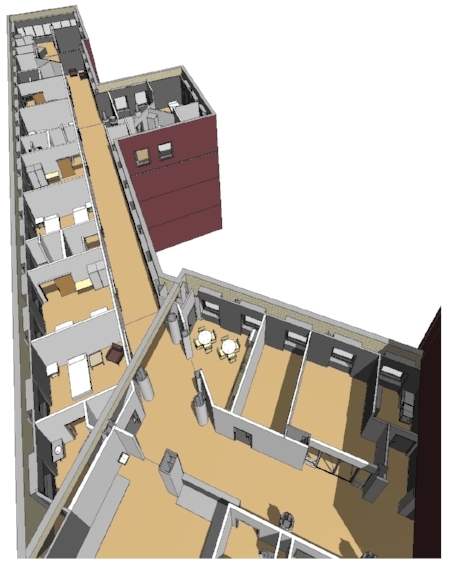 The second floor includes additional administrative offices and computer tech rooms. A complete upgrade to the HVAC and electrical systems are also part of the project scope. This project is currently in the final stages of construction. SMOC is Now Open for Business! 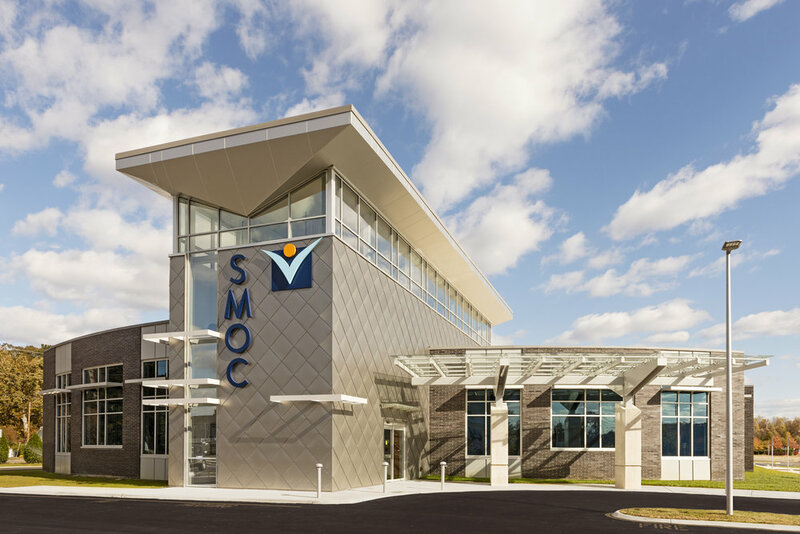 Thursday's grand opening celebration of the Sports Medicine and Orthopaedic Center's (SMOC) newest location in Chesapeake. PF&A has been selected as a finalist in the 2016 Healthcare Design Remodel/Renovation Competition for the Nuss Center design at CHKD! The project is going to be published in the December 2016 issue of Healthcare Design magazine! Please help spread the word and help us win the Reader's Choice Award by casting your vote for Children's Hospital of The King's Daughters Nuss Center! Voting starts today and runs until October 14th. Click on the following link to cast your vote! The Newly Expanded and Renovated Nuss Center is Open! The newly expanded and renovated Nuss Center at CHKD is now open! Pediatric surgeons at CHKD are the pioneers of the Nuss Procedure and have trained extensively under Dr. Donald Nuss, the originator of the Nuss Procedure, a minimally invasive approach to correcting pectus excavatum. In the years since Dr. Donald Nuss developed the groundbreaking, minimally invasive surgery to correct pectus excavatum, CHKD has performed more than 1,800 surgeries to correct the condition, far more than any other center. Because of the number of patients treated and the data gathered, CHKD has also become a worldwide center for pectus research. Exciting drone perspective of the Sports Medicine and Orthopaedic Center's new Chesapeake office building under construction! One of our OR projects for the local children's hospital is featured in Medical Construction & Design magazine's January-February 2016 issue. Click on link below for complete article.